Eclipse (J41) has been a very special whale to me ever since I first saw her when she was only a couple days old. 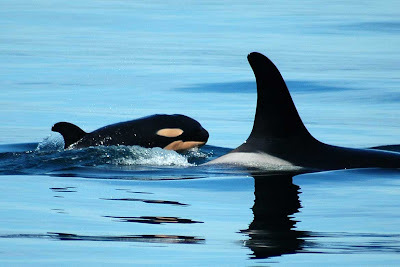 On June 30th, 2005 as the sunset there was no baby with J-Pod, but first thing in the morning on July 1st, 2005 there was a new baby with Shachi (J19). When I saw her for the first time, Eclipse was still a bright orangey-pink, and her forehead was still bumpy with fetal folds. 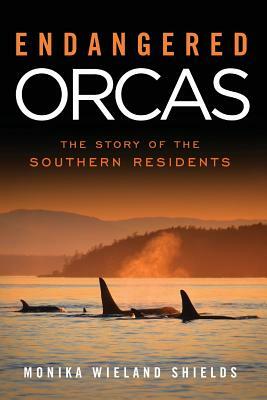 My book, Orca Encounters, was dedicated to Eclipse, partially because during 2005-2006 (the years photographs were taken for my book) I had many awesome viewings of her and her mom, and hence several photos of them in the book. Also, though, Eclipse symbolized for me the future of the Southern Resident killer population that I hoped (and hope) to do my part to protect. While I don't believe Eclipse has any special awareness of me, I continue to have fantastic encounters with her. When kayaking with the whales a couple of weeks ago, it was none other than Eclipse and Shachi who circled the kelp bed we were rafted up in. Today on the Western Prince we had another neat encounter with Eclipse. J-Pod was very spread out and doing a lot of foraging, which means the whales are off in ones and twos and swimming in all different directions. All of the sudden, a little juvenile came zooming past the stern of the boat. Who was that, and why weren't they closer to mom? As the juvenile continued to lunge at the surface and swim at high speed, I spotted the distinct tall, thin fin of Shachi inshore. That was Eclipse, several hundred yards offshore of mom! We watched the J16 family group for a while, and as we started to pull out to head back to Friday Harbor, another little whale came zipping over to the port side of our boat. "That's the same little whale!" the captain called from the wheelhouse. Sure enough, it was Eclipse again, still hundreds of yards from mom, this time twisting and turning at the surface, like many of the larger whales do when they're in hot pursuit of a fish. I grabbed my binoculars to get a better look at what she was doing, and on the very next surfacing Eclipse surfaced facing our boat with a fish in her mouth! While other people see this behavior from time to time, this is the first time I've clearly seen an orca with a fish, and it seems fitting that it was Eclipse. It was so cool to witness Eclipse off and foraging on her own, since now at the age of 3 she's definitely stopped nursing and is on to eating fish. Shachi probably still catches some for her, but it's exciting to know she's able to capture her own prey! Once a calf stops nursing around two years old, it starts to make some exploratory trips away from mom, but I've never seen such a young whale off foraging on its own. It looks like we've got a spunky and independent little whale in Eclipse. Shachi, watching from the shoreline three hundred yards away, should be very proud. 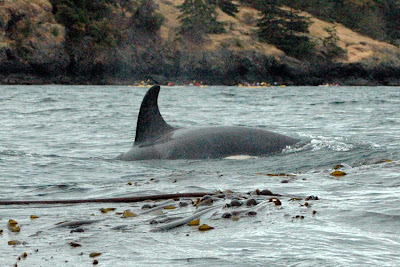 J-Pod has been in essentially the same place for the last few days, and have been "in" from the ocean for the last two weeks. Hopefully that means there is plenty of salmon for Eclipse and the others to eat! How exciting to kayak with the whales! I've never seen a real whale in the wild. Dolphins and sharks, but no whale. Hi Angie, thanks for stopping by and commenting! It's funny, now that its been a couple of weeks since kayaking with the whales it seems almost dream-like, like it never really happened!